“Buy it for yourself,” she said. I looked into her dark brown eyes and wondered if a ten year old girl with no mortgage to pay, groceries to worry about or a vehicle to maintain could really understand the value of a dollar. 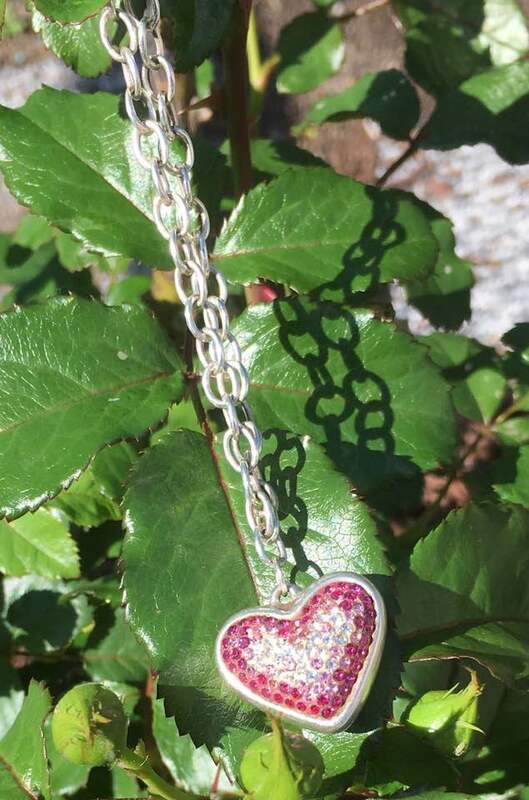 It sure felt nice with the coolness of the silver chain encircling my wrist and the light catching the pink and white stones to make it glitter. I had entered the store in my usual way telling myself at the door that I couldn’t purchase anything. I had to be sure that both girls had clothes to wear and food on the table. How I had found myself gazing into the jewelry cases was beyond me. Obviously, it was a moment of weakness that I shouldn’t have let myself indulge in. “Ask the lady how much,” she persisted. We were talking in low whispers at this point. I had gone from looking to now wearing the item that had called my name from the display. I really didn’t want to know because the minute she spoke, I knew I was going to take it off and the magical moment would be over. There is nothing more frustrating to want something and then have to put it back and walk away. I was mentally beating myself up over it. I should have not touched it at all. “Let’s see,” she said pulling out the box. She looked at the tag. I had this awful feeling creeping into my stomach that I was going to hand it back to her. She returned with her glasses perched on the end of her nose. She began punching numbers into her calculator. She pulled out an ad and did more button pushing. I glanced down at my daughter who was speaking to me sternly non-verbally. I felt the guilt of paying the money as I stood there admiring the piece. I fought down the negative feelings and decided to get it anyway because it had been so long since I had gotten anything for myself. The divorce had left me thinking that I had to make sure I spent every bit of money on the kids to be sure they were taken care of. The woman grabbed the long white box and we followed her to the register. She began the process of entering in the item along with the discounts she had mentioned. In the middle of it, she leaned into look closer at the screen on her register. “You aren’t going to believe this,” she said. Oh, no. Here comes the bad news. She probably had done her math wrong, I thought. I handed over my debit card inwardly thanking God that I could keep the bracelet on for an even cheaper price. That was ten years ago. I have worn it off and on over the years with many compliments. Last week, it broke. I was sitting at an outdoor picnic table, lifted my wrist and the heart fell to the ground leaving the chain around my arm. With much disappointment, I put it in my purse. A few days later, I drove to a jeweler by my house to see if it could be fixed. While I was parking my car in the lot, I found myself thinking again about money. Much in the same way that I had been when I bought the bracelet. I wondered how much it would cost, and would I be able to afford it. This then led to other thoughts about upcoming bills, health insurance payments and a host of things that rushed to the forefront of my thinking. By the time I walked in the front door, I felt somewhat burdened mentally. I approached the counter and a woman with silver hair and large black glasses greeted me. I took the two pieces out of my purse and laid them on the counter. I explained what had happened as she examined it. She jotted down information on an envelope. A repetitive sound started coming from a back room. Suddenly, my small worries about finances didn’t seem so great. “How are you doing now?” I asked. Her complexion was beaming and her smile was so bright. Her eyes looked energetic, and I would have never guessed she had been through such a medical trauma. Before I left, I took her hand again, and I prayed for her body to be completely whole and healthy from head to toe. I felt as if we had blessed each other in a way that only can happen when there is divine intervention. My previous anxiety about my budget had left. I got into the car with a renewed strength that all was well. Even though I have had many experiences where I know my prayers have been answered, I still have moments where I need reassurance that I have a support system working on my behalf that I cannot see. Her words of faith were just what I needed to remind me that I am not alone. I got my bracelet back the other day looking as good as the day I bought it. As I took in her handiwork, I realized that when one little loop of metal was missing, it upset my ability to wear it and enjoy it. Isn’t that just like allowing God into your life? He really is what keeps it all together whether we acknowledge it or not. A relationship with your Heavenly Father will make things go a lot smoother if you are struggling. Give heaven a chance to assist you in all things. Prayer really is the missing link. I was out with my best friend yesterday morning when he spotted this sign. “An estate sale. Should we go?” “I have not ever been to one before. 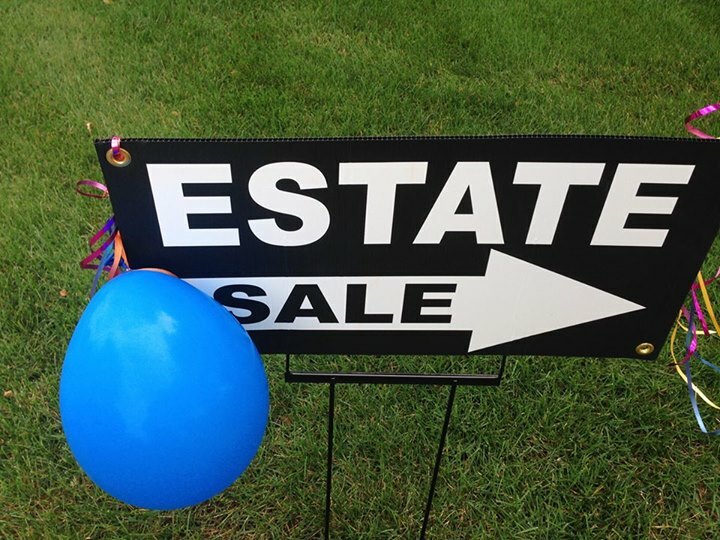 Ok.” For some reason the title ‘estate sale’ makes me envision a long winding driveway that whisks one by a perfectly manicured sprawling lawn up to the doors of a mansion. A butler greets you at the door and you walk around wonderful antiques and treasures of great value from all corners of the earth. So, when we drove by the townhouse garage I was a bit skeptical. In fact, the sale was so obscure, we had to circle around because we drove right by it. “Should we skip it?” he asked. “No,” I said always on the hunt for a story. As we approached the end of the driveway, an older man was shuffling his bills back into his wallet. He wasn’t carrying anything, so I assumed he hadn’t found what he was looking for. He looked at us, smiled, and said sarcastically, “She had quite the collection.” He rolled his eyes and shook his head as he stalked off to his car. This wasn’t looking promising. When I walked into the garage, I was astonished. There were boxes and tables filled with all varieties of angels. I figured the person having the sale had decided to sell off some of her collectables to downsize. It occured to me that this probably wasn’t the case as I walked into the home and found more areas filled with angels. Upon going up the stairs, I discovered another table covered with them. The walls had angels of many types. A bedroom housed more. I was so overtaken as I walked from room to room seeing nothing but angels. I asked a lady who seemed to be running the sale if she could tell me anything about the person these belonged to. “They all were owned by one lady. She died from cancer. She was only 64.” It felt like there was alot of negativity toward the entire situation. Like it was a burden and the items needed to be gotten rid of. I walked out of the house feeling awful. “I wouldn’t even know where to begin,” I said. “How would I even know what was valuable or not?” I then had an idea to call my youngest daughter because she is a doll collector. “Maybe if I come back with her I can have her look things up and find out more for me. 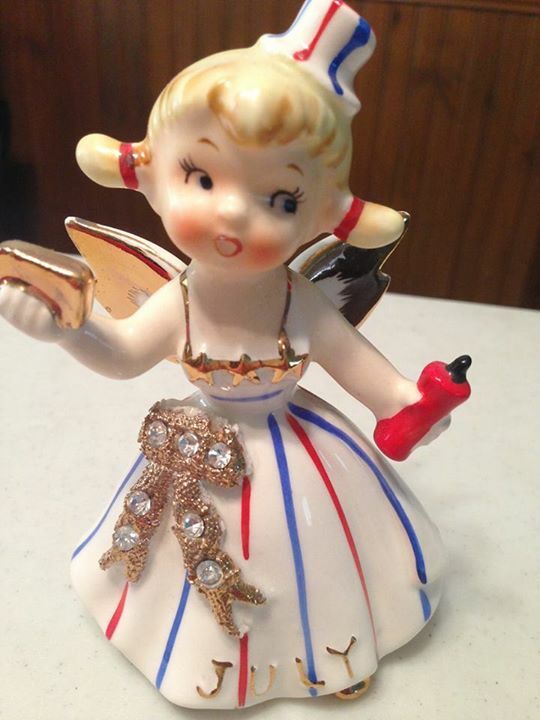 I noticed that many of the angels were from the Napco company like my cookie jar.” Within a short period of time, I was back at the sale accompanied by my child who has a better ability to find rare items than I do. I tried to prepare her mind for the massive amount of angels she was about to see. She had the same reaction I did. “Wow. This is neat,” she said. She began searching online for angels from Napco and showed me a picture of one. “Do they have this?” I looked at it and to my own surprise said, “They had that one upstairs on a table!” We climbed the stairs to the living room on the second floor. I had found my first angel. As she and I walked around I felt led to go in certain rooms. If I found one angel in the garage, I found a matching one that went with it in a bedroom at the back of the house. “They have not put the sets together,” I said. I started to feel sad for the woman who had spent so much time taking such care of the pieces. The company that had been hired to run the sale had spent hours unwrapping thousands of angels that had been carefully stored and preserved. However, they had placed them haphazardly in places out of order. When I went back into the living room area, I noticed a woman sitting in a chair going through boxes at her feet. We began to talk, and I found out more information about the ‘angel lady’. “She and I were good friends,” she said. “She was part of an angel club that met together all the time.” I could see the tears in her eyes as she spoke to me. “Julie told me that she had stage 3 ovarian cancer. When she had gotten the diagnosis she started collecting angels. I think they brought her comfort, and she lived for twenty-five more years. I guess there were only eight woman living in Minnesota with cancer that advanced. When she died in March, she was the last one to go.” My daughter and I bought a few items and returned home. Not knowing what I had purchased, we began looking up Napco and Lefton collectibles. We discovered that many of them were quite valuable, and I felt compelled to return with a new understanding of what these angels meant. This time as I went through the house I felt as if the owner was leading me to get her collection back in the right order. I started to get a sense of peace as we sat and carefully looked over all of the items. Many times throughout the day we heard slight comments such as, “what a hoarder” or “why would someone do this?” I realized these people were missing the point. I also found that many who roared through the place were looking to make money and in that pursuit were missing out on the fact that a woman had died at such a young age from a horrible affliction. 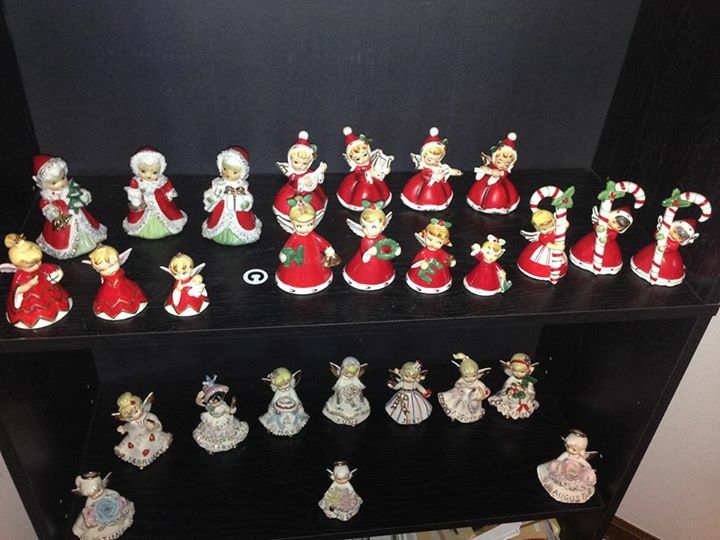 As I pieced together various sets to make them more appealing to potential buyers, I found out that the people running the sale had no knowledge of who Julie was and her reason for collecting angels. Nor did they know that if she became aware of someone in need of food or money, she would make sure she helped with whatever she could give. Her heart was that of what we would expect of an angel. Giving. Kindhearted. Helpful. Friendly. I learned all of this as I sat and listened and tried to gleen as much information about her life from the woman who was her friend. I left at the end of the day with 24 angels for my shelf at home. I cleaned off a space to make room and arranged them in a way that was orderly. I felt as if I had been a part of preserving the history of a stranger who I had come to know in one afternoon. I woke up today and the first thing that caught my eyes were my angels. Because they are so detailed, it is difficult not to get caught up for awhile looking them over and realizing that before I was born, someone had crafted these treasures. Most of what I bought was made in 1956. As I sat gazing at them, I wondered if I should return to the sale to see what was left. This was an odd feeling for me as I have never gone to a sale four times in less than a twenty-four hour period. I don’t hardly ever go to sales in the first place. To be honest, even GoodWill and Salvation Army stores give me the creeps somewhat as I can only think that I am buying stuff that someone died with in their hand. Like that really cheap coffee mug that reads: Have a Great Day! I cannot bring myself to buy it and then enjoy a drink from it. I had spent so much time in this woman’s house, knew of her recent death and had not felt unsettled about that at all. The more time I spent surrounded by her angels, the more peaceful I became. We decided to visit again today to see if many more pieces had been sold. I found a few sets still sitting out that I had arranged the day before. As she and I walked around the garage, I began to notice alot of July angels. I pointed this out to my daughter. “I wonder if her birthday was in July,” she said. Moments later we heard a woman inside the house say, “Julie would have been so happy to see all of her collections being bought by people so they could go on being enjoyed. Today is her birthday so this sale is just all that more special.” I could not believe my ears! 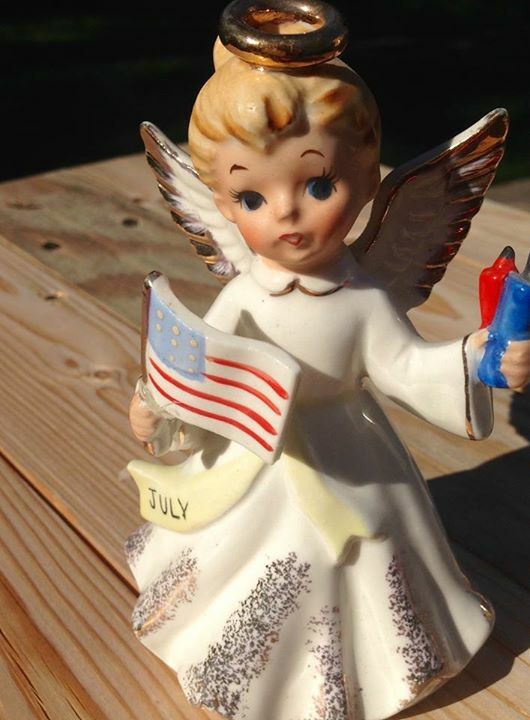 I quickly snatched up a July angel to take home to my shelf. I didn’t want to leave the sale without taking a token to honor this woman. Apparently, it had been a ‘coincidence’ that the sale of her beloved treasures landed on her birthday. This sale showed up in my life the day after I prayed and asked God if I could be made more aware of angels in my life. I have been reading books and different accounts of how people have encountered angels. I long for that touch of heaven here on earth all the time. Yet, at the same time, I am a little afraid. I think about when the angels showed up in the field to announce the birth of Jesus. The shepherds were scared out of their wits. Knowing this, I asked to be shown the presence of angels in a way that was gentle and non-threatening that I could easily accept. I believe now more than ever. Even though I never met her, I will never forget Julie and her angelic friends.